The Livana hills project consists of 4 villas on a secluded hillside near a succession of sandy beaches along the Southwest coast of Naxos, one last villa is still available, villa B. The villas will be in a quiet rural location with beautiful sea views from Mikri Vigla to Alyko; the beaches are relatively quiet even in the height of the season. 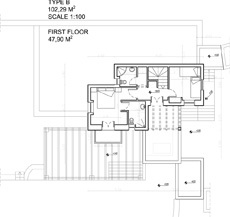 The villa will have 3 bedrooms and 3 bathrooms and a storage room. 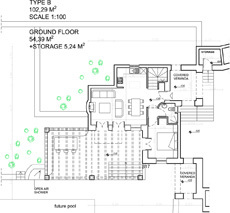 The villa will have private grounds of 1145 m2 which will be bordered by low walls of natural stone. The land has low growing vegetation, including wild thyme, and can be left in its natural state without much maintenance or can be developed as a garden. The Livana Hills project is new and at this stage the interior plans can be adapted to a great extent to the preferences of the prospective buyer. The villa have not yet been built; once the villa is sold the construction process will take 12-18 months. The villa has an elegant design and will be built to very high standards of construction. 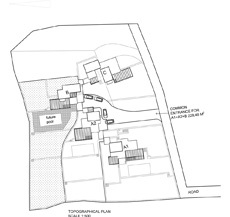 Examples of villas designed and constructed by the same architect can be seen below. The villa will have extensive terraces in natural stone which provide outdoor dining areas with both sun and shade and greatly extend the living space of the villa. The land in front slopes down to the road, no other houses can be build on the land so the views from the villa remains intact. The location can be reached via a small paved road, which is accessible with a normal car. The private grounds of the villa provide a generous space for a swimming pool. There are some excellent traditional restaurants in the area. During the season the villages of Mikri Vigla and Alyko have 2 well stocked super markets which sell fresh produce as well as general supplies and are about 5-10 minutes driving distance respectively. Mikri Vigla also has an excellent fresh bakery. The two nearby beaches, Mikri Vigla and Orkos, are on either side of a headland which always provides shelter to one of the beaches. The prevailing wind during the summer is the Meltemi; usually Mikri Vigla beach is the most sheltered of the two beaches. Orkos Beach has ideal wind-and kite surfing conditions; 2 wind- and kite surfing schools provide lessons and equipment hire. Driving distance to Naxos town and the local airport is about 25 minutes. Fully fitted kitchen (except the electrical appliances). Fitted cupboards in the bedrooms. Terraces paved in natural stone with a wooden pergola. Boundary walls in natural stone. Under-floor pipes for the central heating system. Electrical wiring for air conditioning units (units not included). Private water and electric meters. Approximately 1000 m2 private grounds. Optional extras: swimming pool and additional terraces. The plans for villa B are below. Plans and further details can be sent on request. All photographs and text used are the property of Naxos Island Holidays Ltd and cannot be reproduced without prior permission.